Palmia Observatory: Smoky skies; The value of image stacking; Moana Kea; ModRing space station; HR color index and Python code; How beauty leads physics astray? Smoky skies; The value of image stacking; Moana Kea; ModRing space station; HR color index and Python code; How beauty leads physics astray? Well this week we were looking forward to the monthly OCA star party, but it has been cancelled due to the many forest fires, especially the Holy fire, now raging in southern California. But we have other, mostly indoor, topics for discussion. 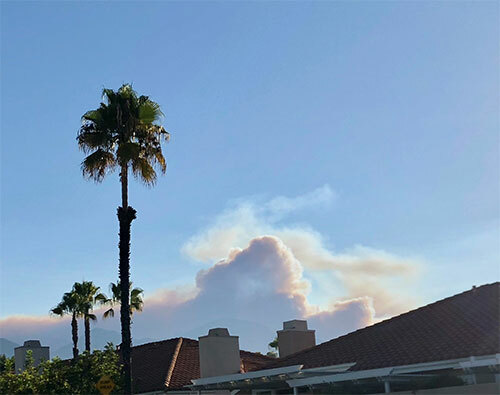 Check out this photo of the street next to our observatory and the fire and smoke clouds, several miles in the distance, which are coming from the Holy Jim canyon fire. Then, just a couple of days later, the smoke from this fire was so dark that we had to turn on our inside lights just to read anything. Nope, we don't want to be outside observing in all that smoke. We had hoped to repeat some of our earlier image taking of Jupiter and Mars (see the posts of August 3 and August 7) and see if we could clear up the images and remove some of the effects of atmospheric turbulence. We received an email from reader, Retired Legacy Coder, now Astronomer, Larry, from the San Diego Astronomy Club, who asked if I had been doing any stacking of images to get better resolution No, I have not, because I didn't really want to go down that path, but now I can see that it is going to be necessary if you want to get good images of the planets. So, thanks for that, Larry! We also got a couple of images from OCA He's into Bugs, George, who forwarded some of his great images of Mars, Jupiter and Saturn. Take a look at this great composite image! George says he took these images from his front yard and stacked a couple of thousand images to get these great resolution images. He used an 8se with 2X Barlow with ZWO camera on AVX mount. Wow, now I see what can be done with stacking! Thanks for that, George! 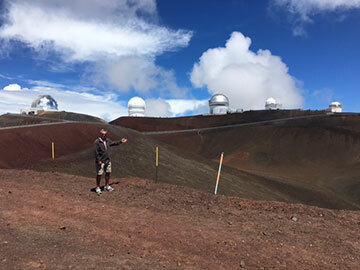 Also, just because there are fires in California, other members our little science squad, including Retired Superintendent, Jay, who forwarded some images of his tour of the observatories on Moana Kea. Jay said they were at 13,700 feet and the area was wide open and no crowds. That is pretty neat and I can remember the last time we were in Hawaii we thought of going up Moana Kea but our rental car agreement said in big bold letters that we were not allowed to take the rental car there. Anyway, thanks for sharing the pictures, Jay, and see you when you are back here! So with smoky skies to contend with it was easy enough to spend more time inside and this time we elected to attend a presentation at a local AIAA meeting at Golden West College, where our Science Squadron member, Gravity Guy, Ken, made a presentation on the ModRing Structure, which was Ken's way of making a large space station capable of supporting hundreds of people in space for 2-3 years duration. Ken started the presentation with some examples of early visions of space stations, starting mostly in the 1950's, and some earlier than that, but all of these examples would be impossibly expensive to build and were never realistic. 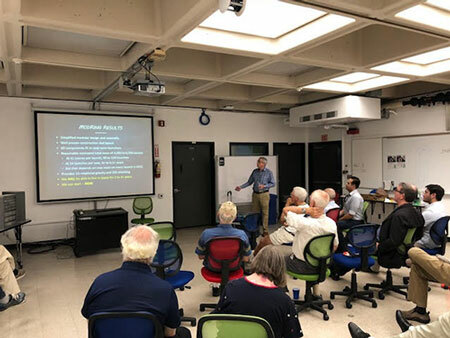 Ken's ModRing approach starts with components that can be launched by existing rocket boosters today, assembled in space without large numbers of spacewalking astronauts, can provide protections from cosmic and solar rays, and yet able to rotate and provide artificial Earth gravity. 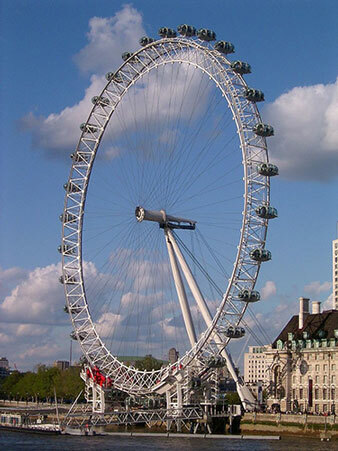 The best example Ken used for how this ModRing structure might look is shown in the photo below of the London Eye. This ModRing type of space structure could be constructed in space, piecemeal, two oppositely positioned capsules at a time. Now the London Eye is only 120 meters in diameter and rotates slow enough, 1/30 RPM, so that the wheel does not need to stop and guests can just walk on and off, when their car is at ground level. Ok, so now image a similar structure in space that has somewhere between 200 to 300 meters in radius and rotates say between 2 to 3 RPM. These dimensions and speeds would allow for Earth equivalent gravity. The wheel cars would be replaced with pressurized capsules, about the same size of a modern jumbo jet fuselage, with maybe three of them stacked end to end, much wider than the London Eye. There would also be passageways and elevators connecting wheel's rim to the center axle to allow inhabitants to move from capsule to capsule. It was a pretty neat idea and presentation. Two key questions for me, which I asked Ken were why he sees the wheel being stopped to add new capsules. He reminded me, that unlike the images that we have all seen of how easy it is to position parts of spacecraft, when they are in orbit and in freefall, is that this structure, while in orbit, is rotating fast enough so that each capsule is accelerating at the equivalent of one Earth g, so to position a new section with the wheel rotating would require a lot of energy. At the same time, it will also take some energy to get the wheel rotating and to bring it to a stop for adding new modules. Also in the discussion about protecting the inhabitants from radiation and how some theorists project growing plants in space, I asked Ken how plants and food would be grown in space when they need sunlight to grow, but any window would at the same time subject the plants to intense radiation. The colonies plants would have their DNA cooked before they had a chance to grow. Ken answered that yes this problem was understood and that some designs have been based on mirrors, which would direct the sunlight to the plant location while the space based radiation would be blocked. Yeah, pretty neat. So, I guess we won't actually be seeing the typical Earth based greenhouse on Mars or on the Moon. Anyway, thanks for that presentation, Ken! 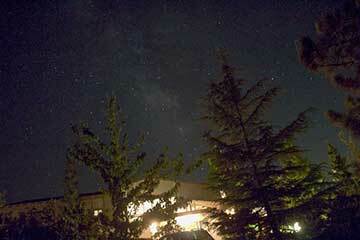 Ok, it's time for a little astrophysics. You all have seen instances of the Hertzsprung - Russell diagram which shows the evolutionary sequence of stars from the main sequence to red giants and finally ending up as white dwarfs if they don't blow up. 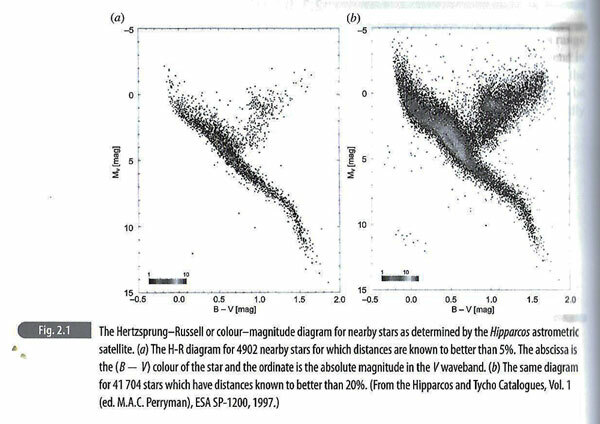 Anyway the diagrams are usually shown with the understanding that the more leftward on the diagram the star appears means that the star has a hotter surface temperature. In some diagrams, like the one below, horizontal axis display is in terms of color as indicated by the B-V color index. So, each time I see a HR diagram like this, I wonder how is the B-V color index correlated with temperature? Well after reading some of the "High Energy Astrophysics" book, it dawned on me that the secret was to just correlated the ratios of the Planck Blackbody spectrum, measured in the B filter wavelength and in the V filter wavelength. So the hotter the star, the more the spectrum shines in blue light and ration of B-V will correspond directly to temperature. 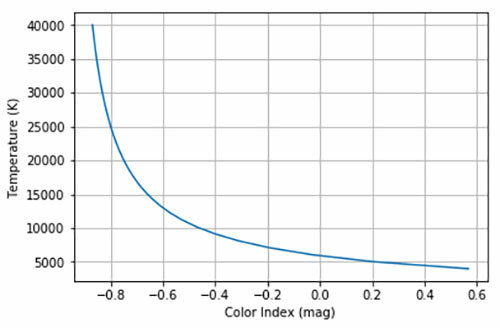 Astronomers like B-V color index because color is something that can be directly measured. So, recognizing that I could just calculate the Planck spectra for stars, as a function of temperature, and then calculate the amount of light coming into the B filter and into the V filter, the surface temperature of a star could be plotted versus the B-V color index. Check out the plot below which was one of the first calculations I ever have done using Python. Remember that Python is now the language of choice for astronomers. 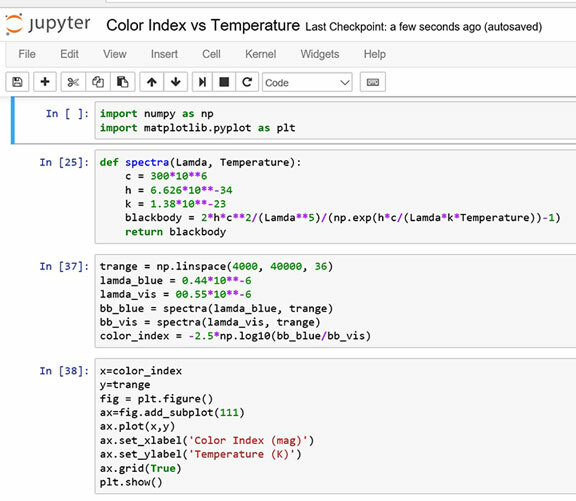 Just in case you are interested in what the Python code looks like for this calculation, check out the screenshot capture below. Cell  shows the Planck blackbody curve calculation. Cell  shows how the amount of light for the B and V filters is calculated for each value of stellar temperature. Cell  just sets up the graph and displays the graph. I like how Python handles implied calculation on arrays, stuff I would have had to use For loops or Do loops in Fortran or C. So this little example calculation was just right for me to do and it gave me a chance to see if I could program it up in Python. Yep, I think it looks ok! Finally, we can end this post with a book recommendation. 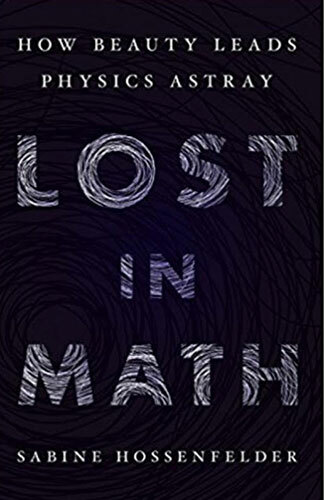 I found this new book by Sabine Hossenfelder, "Lost in Math: How Beauty Leads Physics Astray" to be a very engaging, informative and easy to ready history and discussion of how the idea of "beauty" and "symmetry" has been a guiding principle leading physics into the unknown, even when beauty itself is not a scientifically defined topic. In my own studies of symmetry in physics, with all of the associated topics of Lie groups, group representations and gauge symmetry, it is all pretty complicated and abstract and it is still hard for me to get a good understanding of it all, but nothing yet gives me a true appreciation of what others call the beauty of the subject. Sabine, a particle physicist herself, tells how the idea of beauty and symmetry was used for many years to guide the early particle physicists in the development of the standard model. But ever since the early 70's, this approach has not lead to any new breakthroughs in physics, even though it is the basis behind the supersymmetry theory. She includes interviews with the old timers, who recognized the power of symmetry and used it to verify the standard model, but in her career, no new discoveries have been made using symmetry. Physicists thought and hoped that developments at the Large Hadron Collider (LHC) at CERN would have by now found some of the supersymmetric particles that are predicted, but, no, no such particles have yet been found. It is almost as if physicists have reached the end of experimental verification of their ideas. Supersymmetry is a beautiful idea, an idea that is still waiting to be verified. 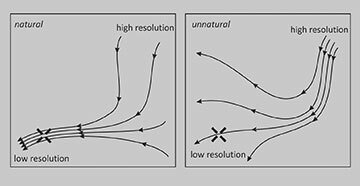 And yet, the ideas of symmetry have been so powerful in understanding nature up till now, it is not clear what the path forward will be if these particles are not discovered and verified. Note that it is not up to nature to make our job easy and symmetry might not be applicable all the time. If the supersymmetric particles are not found, then many physicists say they have no other way forward and will have to start over to enable a new way for the understanding of he mysteries of dark matter and dark energy. So, it is a great book and has lots of interviews with the leading physicists and I am only about half way through. One diagram that I found especially significant is the one below, where regardless of what the next "theory of everything" is based on, when it must be constructed following the "natural" path outlined below. There is just too much verification of existing quantum theories and general relativity theories that the future "theory of everything" does not have to merge and describe those experimentally verified results. One of the interviewees, Nima Arkani-Hamed, said that it is hard to develop new theories of everything because the new theory is constrained by what we already know works in the quantum and gravity domain. Not that those theories are the ultimate or best explanation, but there is no denying that they correctly can predict the results of every experiment conceived of today.